Early this year I decided "Soul's Gate" by James Rubart is my new favorite novel. Now that I've read Memory's Door, Book 2 in the Wellspring series, I can say that the series is now my favorite as well. What would be very hard would be choosing between these books. Book 1 struck me as brilliant, largely because it was so different than anything I've ever read before--closest I could describe it would be the Frank Peretti books but with a fresh, contemporary twist--but book two stands on its own and has powerful and unique qualities as well. It is an incredible follow-up to book 1, but can also be enjoyed as a stand alone novel. One might consider this book a spiritual allegory, but I think it would be better to explain it as a book that takes spiritual realities and puts them into words and pictures that we can understand with our limited human senses. As a person who is open to spiritual experiences, I would say that many of the descriptions accurately capture, as best as one can with our limited vocabulary, aspects of the spiritual realm. Jim's passion is bringing people to freedom. Book 1 in this series focused on inner healing and growing in awareness of the spiritual dimension, but book 2 takes a closer look at two specific areas: freedom from regrets and from religiosity. The religiosity aspect especially tickled me. I feel like I have found freedom in this area, and yet it still tries to sneak up on me at times, not to mention, we can all become more free in this area. Jim's depiction of religiosity actually made me giggle in delight at times, because it was such an affirmation of what I should leave behind and what it truly means to be a believer. And let me mention without spoiling anything, that I absolutely loved who "the wolf"' turned out to be. Jim's writing is fresh and clean and keeps you quickly turning pages. Then, when you least expect it, he hits you with a gorgeous description or unique perspective that truly causes the book to shine. This is a perfect example of what some are calling "life-changing" or "transformational" fiction. It is sure to touch your heart and effect you in a significant way. Little wonder book one took the 2013 Christy Award for visionary fiction. I can't wait for the next installment coming May 2014. If you'd like to read my full review of Soul's Gate, click here. 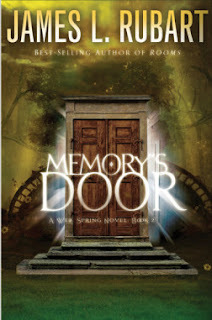 And to watch the amazing trailer for Memory's Door I featured last week, click here. What is the most life changing book you've ever read? If you could only choose one book or series to recommend to everyone you know, what would it be? Wow, Definitely a book to read when you are ready for a journey, not just a distraction! I love that trailer ==er, interview? It sells the book in any case. Deb, I decided I'm going to do this style of trailer for my book coming out this fall. My son and husband are both good at video stuff. Maybe I'll send my script to the Inkies to see what you ladies think. This sounds like a great series. If I ever get caught up, I'll have to add it to my skyscraper-like TBR pile. I'm looking forward to reading Jim's new book. It's not just his books that keep you enthralled, but he's one of the few people that had me spending hours reading his blogposts when I interviewed him for the ACFW Fiction Finder blog back when The Chair came out. His passion draws you in no matter what he's writing about. Thanks for giving your insight, Dina. Now I really, really, really want to read this book, Dina. It might have to jump ahead on my TBR. I LOVED his book "Rooms," but haven't started this series yet. I have Soul's Gate, and you've motived me to get started! Definitely get started on that, Celeste :) Have you had the pleasure of meeting Jim in person at Blue Ridge? He's such an awesome person.